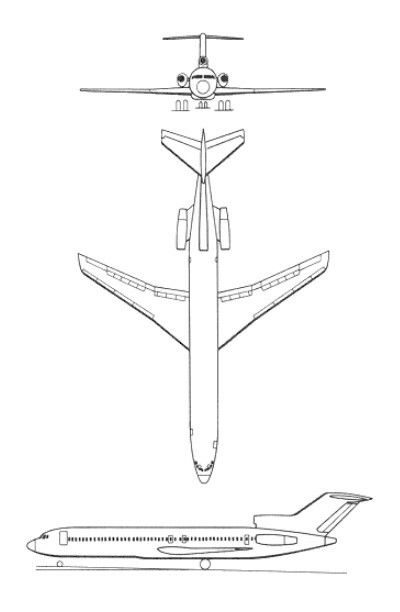 Design work of the Boeing 727, in its distinctive tri-jet configuration, had begun in early 1956 with the design being finalised in Septem-ber 1959. Considerable savings in construction were envisaged with the fuselage upper sections being identical to the B.707/720 series. The airliner was to be independent of ground support with a Garrett-AiResearch GTC85 auxiliary power unit for electrics, pneumatic starting and cabin airconditioning. Construc-tion go ahead came in August 1960 and, on 3 February 1963, N7001U made the first flight, out of Renton. FAA certification of the B.727-100 followed on 20 December 1963 and the first commercial flight of the type was made by Eastern Airlines on 1 February 1964 between Philadelphia and Florida. The wing, with leading-edge slats and the newly-invented Kruger flaps to provide high lift for takeoff from short landing strips, was the most advanced then built. Unlike the 707, the 727 has power-operated control surfaces, but tabs on the primary controls enable the pilot to take over in emergencies. The 727 has a main passenger access at the rear, via a hydraulic stairway beneath the rear fuselage, and a pressure-tight bulkhead door inside. The 727-100 first flew on 9 February 1963, first entering service with Eastern Air Lines on 1 February 1964, with the 727-100C first entering service on 23 April 1966. Boeing built a cargo version, installing a heavier flooring, floor beams and a cargo door and the first -100C was ready in mid 1964; a convertible passenger/freight configuration and able to carry 30,000 lb (13608 kg) over a range of 1,900 miles (3058 km). The 727-100Cs are powered by three Pratt and Whitney JT8D-M turbofans of 14500 lbs thrust each, are capable of a maximum speed of around 512 knots and a cruise of 461 knots while lifting a maximum take off weight of 80740 kg (178000 lbs) over a maximum range - at all up weight - of 4800 km (2476 nm). A total of 582 Series -100 were built, the delivered in October 1972. Originally built as the to seat a maximum of 131 pas-sengers (727-100), it was quickly followed by a stretched version, the 727-200 which had a 20 ft (6,10 m) longer fuselage than the 727-100. The 727-200 first flying on 27 July 1967 and received FAA certification on 30 November 1967. 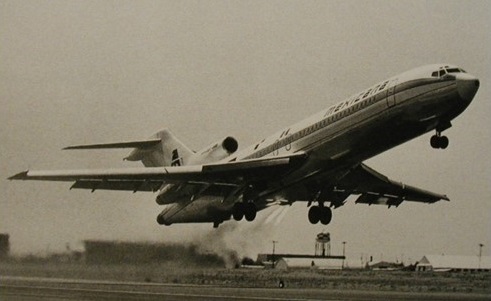 The improved and stretched fuselage 727-200 entered service with Northeast Airlines 14 December 1967. The last of 1,260 727-200s was delivered in September 1984. 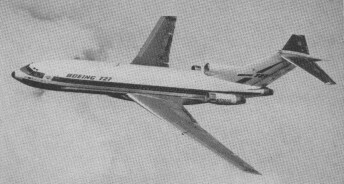 As built, the standard 727-100 had most of its fuel in three main tanks, one in each wing (Nos 1 and 2) and one in the wing center section (Main Tank No 3). At the request of Australia's two major domestic airlines, Boeing increased the capacity with the use of a cell added to the No 2 tank. Fuel capacity remained unchanged for the 727-200 but under the 'Advanced 727' program to improve the breed (of which more fuel was but one of many refinements), the standard fuel capacity was increased with a larger No 2 tank. In addition, a series of optional flexible 'modular' fuel tanks could be installed in the forward and aft baggage compartments. The Boeing 727 had a factory option for JATO bottles and Mexicana ordered theirs that way for high elevation airfields. Only six examples of the 727 have ever been operated by the American armed forces. All but one of the six belonged to Detachment One of the District of Columbia Air National Guard (DC ANG) at Andrews AFB, Maryland. General Maxwell R. Thurman, head of US Southern Command in Panama, used the sixth machine for his frequent travels between Central America and Washington. Thurman's aircraft is Boeing C-22A 84-0193, a model 727-030 (c/n 18362) which once served with the Federal Aviation Administration under the civil identity N78. It is maintained and operated by the US Air Force's 310th Military Airlift Squadron, 61st Military Airlift Group, at Howard AFB, Panama. Somewhat confusingly, the C-22A has a higher serial number than the four Boeing C-22Bs (model 727-035) which are operated by the DC ANG. The C-22Bs were purchased to replace six Boeing T-43A (model 737) transports formerly flown by the DC ANG. The C-22C is a 'stretched' 727-200 series version. The C-22Bs and C-22C are all painted in such a way that national insignia can be quickly removed. A total of 1,832 examples had been built when production ended in 1984. US operator United Parcel Service’s re-engined their 727s with RR Tay 651s. This provided an 18% fuel burn improvement. Engines: 3 x Pratt & Whitney JT8D-7 turbofans, 14,000 1bs thrust each. Length: 133 ft 2 in. Engines: 3 x Pratt & Whitney JT8D-7, 14000 lb. Max speed: 630 mph @ 22,000 ft. Engines: 3 x Pratt & Whitney JT8D-7 turbofan, 14,000 lb (6350 kg) st. Length: 153 ft 2 in (46.69 m). Wing area: 1,700 sq.ft (157.9 sq.m). Gross weight: 172 000 lb (78 015 kg). Max cruising speed: 595 mph (958 kph) at 21,600 ft (6585 m). Typical range: 1290 miles (2,076 km). Engines: 3 x Pratt & Whitney JT8D-9, 14,500 lb thrust. Length: 153 ft. 2 in. Payload with full fuel: 17,957 lbs. Maximum taxi weight: 173,000 lbs. Maximum brake release weight: 172,600 lbs. Maximum landing weight: 150,000 lbs. Zero fuel weight: 136,000 lbs. Maximum rate of climb: 2,500 fpm. One-engine-out rate of climb: 1,000 fpm. One-engine-out climb gradient at 213 kt (Vy): 4.6 degrees. Maximum cruise speed: 514 kts. Economy cruise speed: 495 kts. Duration to dry tanks, max cruise: 4.5 hrs. Duration to dry tanks, econ cruise: 5.2 hrs. Stall speed, clean: 165 kts. Stall speed, full flaps: 100 kts. Cabin pressurization differential: 8.6 psi. Engines: 3 x Pratt & Whitney JT8D-15, 14,500 lb. Engines: 3 x Pratt & Whitney JT8D-7A, 14000 lb.